STMicroelectronics, Schneider Electric, Rossignol, Teisseire, Capgemini Ernst & Young, Allibert, Soitec, Caterpillar… these are just a few of the leading companies that contribute to the strength and diversity of Grenoble's economy. 75% of jobs in the region are in the services and retail sector (61% in services, 14% in retail) and 21% of jobs are industrial in nature. 1 job in scientific research or technological innovation generates at least 3 jobs in related industries, public and private services, retail, etc. Along with these leading companies, Grenoble often sees new, innovative companies and activities emerge. But why such innovation in Grenoble? Its main strength lies in close ties between research, universities and the business world, enhanced by a culture of working together at the local, regional, national and european levels. 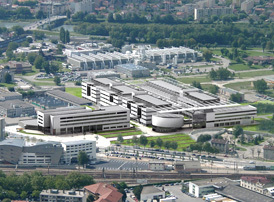 Created by the CEA (Atomic Energy Commission), the INPG (National Polytechnic Institute - Grenoble) and various levels of local governement, in partnership with the University of Grenoble, public research laboratories and the business world, Minatec is the first European center for micro and nanotechnologies. International center of knowledge for tomorrow's technologies, officially inaugurated on June 1, 2006, Minatec brings together students, teachers, researchers and businesses around the new opportunities of micro and nanotechnologies and should lead to the creation of 1500 direct jobs, in the public and private sectors, and triple that number of indirect jobs in the Grenoble area. Grenoble Ecole de Management is an active player in this project, thanks to its partnership with the CEA's Direction Recherche Technologique.